Could the Government hide something as crucial as the existence of alien structures on the surface of the Moon? And, more importantly, did NASA blow up some of those structures back in 2009? The idea that our Moon might still preserve mysterious structures built eons ago by some intelligent alien race is not new. Over the years, countless photos of UFOs and other anomalous structures have turned up, revealing constructions with complex architectures that couldn’t had been built by the primitive earth dwellers. On June 18, 2009, NASA launched a new dual mission – a probe the size of a car named Lunar Reconnaissance Orbiter (LRO) and a smaller spacecraft called LCROSS (Lunar Crater Observation and Sensing Satellite). LRO sole purpose was to provide detailed maps of the lunar surface while LCROSS had a kamikaze mission – it was sent on a precise and carefully planned collision course interacting with a specific area, a crater found near the Moon’s South Pole. According to the Agency’s official statement, the impact caused by LCROSS would determine the presence (or absence) of water in the cloaked crater, but some conspiracy theorists couldn’t just simply buy this ‘official’ explanation. They believe LCROSS had a more complex mission and a more destructive payload than what the space agency is stating. 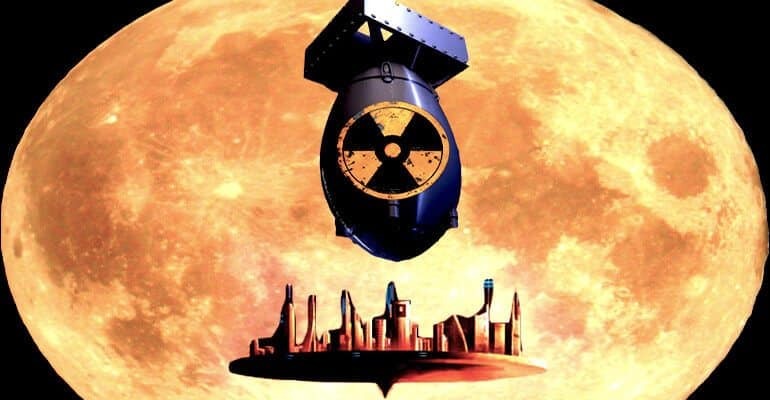 It allegedly carried a small nuclear device and was aimed at destroying the alien base located in and around the crater. But why would they do such a thing? When you think about it, the existence of an alien outpost on our natural (or artificial) satellite isn’t such a stretch of imagination. If an extraterrestrial species would want to keep a close eye on the evolution of mankind, the Moon would be probably the perfect location to set up camp. After all, in our own space race, we did the same because it simply is a question of logistics. On October 9th, 2009, at 7:31 a.m., LCROSS fulfilled its mission by impacting the Moon at a velocity of 5,600 miles per hour (9,000 km/h). Despite keeping a watchful eye, observers on Earth couldn’t see the shock wave due to the impact site being on the dark side of the Moon, which is never visible from down here. Because of this, determining whether LCROSS was in fact a mini nuke was impossible. Although NASA streamed the event live, there are some who believe the entire video feed was manufactured. This wouldn’t have required a great skill since the live footage showed very little. …alas, the promised giant plume of impact debris was invisible from Earth, leaving a receptive public feeling cheated, said leading lunar and planetary scientist Dr. Paul Spudis. Is there any to prove those claims? The short answer is yes. 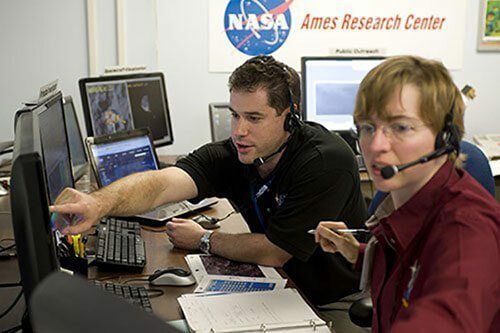 Take a look at the photo below of NASA researchers Anthony Colaprete and Karen Gundy-Burlet during work at the Ames Research Center in Silicon Valley. Seen anything strange? If not, lets have a closer look at the monitor display. 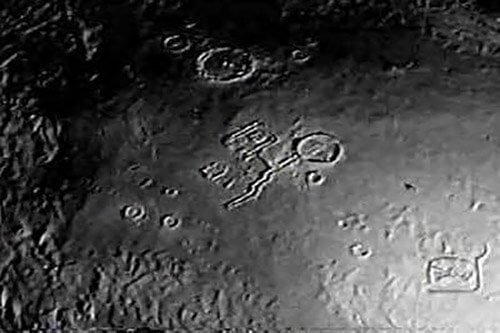 That actually looks like a rectangular structure and the odd thing is that it’s located in the Cabeus crater – the very same crater that LCROSS deliberately crashed into. If we carefully look at the picture, an intricate and artificial design can be observed. This ‘building’ and others like it could be the real reason why we stopped going to the Moon. But that doesn’t explain the destructive approach towards these ancient lunar structures does it? While some would say it’s easier to just nuke the hell out of anomalies rather than rewrite the history books, others believe that these buildings are meaningless now that the Government has captured alien technology, and so they’re only getting rid of the remaining proof. 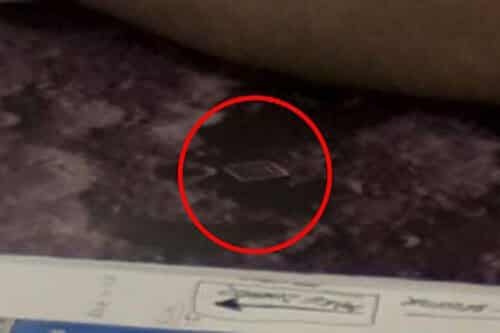 The close up picture isn’t from the monitor display, it’s from the picture he’s resting his arm on.